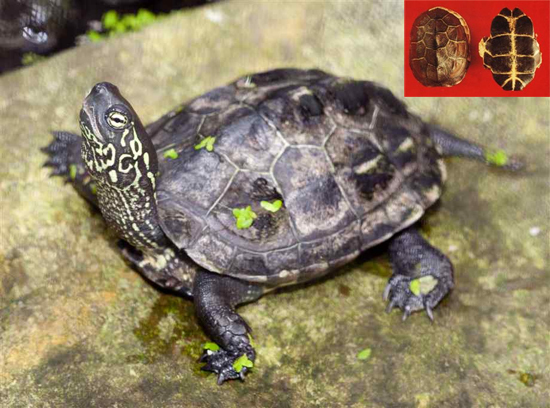 Common Name: Tortoise plastron, freshwater tortoise shell. Part Used & Method for Pharmaceutical Preparations: The plastron of a freshwater tortoise can be obtained all year round. It is cleaned and dried in the sun. Properties: Sweet, salty and cold. Meridians: Liver, kidney and heart. Functions: 1. To nourish yin and subdue yang; 2. To tonify the kidneys and strengthen the bones. 1. Hyperactivity of liver yang due to deficient yin of the liver and kidneys manifested as dizziness, distension and pain in the head and blurred vision. Tortoise plastron (Guiban) is used with Cyathula root (Niuxi), White peony root (Baishao), Sea-ear shell (Shijueming) and Uncaria stem (Gouteng). 2. Malnutrition of tendons and muscles due to yin consumed by febrile diseases manifested as spasms and convulsions of hands and feet. Tortoise plastron (Guiban) is used with Fresh rehmannia root (Shengdihuang), Donkey hide gelatin (Ejiao) and Oyster shell (Muli). 3. Deficient yin and excessive fire manifested as afternoon fever, cough with blood, night sweating and seminal emissions. Tortoise plastron (Guiban) is used with Prepared rehmannia root (Shudihuang) in the formula Da Buyin Wan. 4. Deficient yin of the liver and kidney manifested as soreness and weakness of the lower back and knees and fragile bones and tendons. Tortoise plastron (Guiban) is used with Cyathula root (Niuxi), Dragon's bone (Longgu) and Prepared rehmannia root (Shudihuang). 5. Derangement of mind by deficiency of yin and blood manifested as insomnia, forgetfulness, palpitations and fright. Tortoise plastron (Guiban) is used with Grass-leaved sweetflag (Shichangpu), Dragon's bone (Longgu), and Polygala root (Yuanzhi) in the formula Kongsheng Zhenzhong Dan. 6. Deficient yin and heat in the blood manifested as excessive menstruation and uterine bleeding. Tortoise plastron (Guiban) is used with Fresh rehmannia root (Shengdihuang) and Eclipta (Mohanlian). Dosage: 10-30 g decocted prior to other herbs for internal use. 2. Contraindicated in patients with Cold due to Spleen and Stomach Deficiency.